Lydia has always been our June Accommodations special agent. She is extremely engaged in making us feel welcome and well taken care of. She shared her knowledge of other activities and hikes in that region that really enhances our appreciation of the High Sierras, and keeps us coming back for more. We had a wonderful stay. Thanks again ! The log cabin was the perfect accommodation for us this trip. We would like to extend our thanks personally the owner's of the property for sharing it with us. It reminded us of home. Readily available to answer questions. Very friendly and helpful. Robin was fantastic in making all the changes with our arrival. She went above and beyond to help us. This is our second time, and it will not be the last. 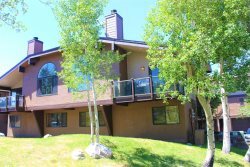 In my opinion it is the best place to stay in the June lake area. My family have rented with interlaken for many years now. The staff have been friendly and helpful over the phone. Interlaken 33 is surely a place we would like to go back to as it was clean. Everything seemed well kept. Beautiful home thank you so much!